Consisting of 5/7 beds, with private green garden with veranda and co-owner swimming pool. Panoramic view over the relaxing and grazing cultivated green hills of San Teodoro, where you will have the opportunity to admire horses and cows only. The area is cool and light windy during the warm and sunny summer months as well, a real and natural environment of the Sardinian island, near the city center of San Teodoro but isolated from the crowded and famous touristic center of the Gallura region. Ideal place for a family or for people looking for a peaceful place, not to much far away from the sea and from the city center. Die Wohnung ist in einem guten Zustand und mit vielen nützlichen Dingen ausgestattet, die man gerne mal vergisst. Auch Geschirr ist mehr als ausreichend vorhanden. Die Wohnung liegt direkt am Pool (wie auf den Fotos dargestellt). Natürlich liegt die Anlage außerhalb und man benötigt ein Fahrzeug aber das war uns vorher klar. Der Vermieter ist sehr nett und spricht auch gut deutsch. Kleine Probleme werden zeitnah gelöst. Wir können die Wohnung absolut weiterempfehlen. Die Wohnung ist sehr zu empfehlen. Sie ist schön eingerichtet, sehr sauber und mit allen notwendigen Dingen ausgestattet. Die Lage ist ruhig, etwas abseits von San Teodoro gelegen. Wir haben unseren Aufenthalt dort sehr genossen und würden dort jederzeit wieder mieten ! Nous avons passé 13 nuits chez M.Patrizio Carnevale que nous remercions. L'appartement est très agréable, fonctionnel. Le cadre est superbe et reposant. La piscine de la résidence est vraiment un plus, surtout dans l'arrière saison car la fréquentation y est quasi inexistante, nous avions donc la piscine pour nous très souvent. Aria fresca, pulita e profumata di mirto ! Paesaggi collinare che riportano indietro nel tempo. Il mare sapevamo già che era da favola. La casa ti riporta alle comodità ed ai servizi che hai nella tua stessa casa di sempre. Che dire di più ? Ci torno anche il prossimo anno !! Appartamento molto accogliente, pulito e arredato con uno stile molto elegante, specialmente gli arredi delle due camere da letto sono veramente speciali; il soggiorno e l’ingresso fanno parte dello stesso locale e sono anch’essi ben dotati di tutti i comfort necessari a trascorrere una piacevole vacanza, in particolare segnalo la presenza di una lavastoviglie, un forno (anche se non lo abbiamo mai utilizzato) e un impianto di climatizzazione funzionante a dovere. L’appartamento, attraverso una vetrata a due ante, da sulla veranda e sul girardino privato, in veranda è presente un tavolo che rende molto piacevole pranzo e cena all’aperto. Bagno pulito e completo. Il residence ha una piscina comune, che è molto rilassante ed ottima anche per i bambini. È doveroso inoltre sottolineare la silenziosità e la tranquillità che padroneggiano l’ambiente: fantastico! Le spiagge di San Teodoro sono a dir poco stupende e per raggiungerle è necessaria l’auto, però per fortuna la più vicina dista poco più di 5 minuti. Proprietario disponibilissimo e gentilissimo; vi saprà sicuramente dare consigli su cosa vedere e dove andare (come ha fatto con noi) oltre che è disponibile ad ascoltare e risolvere ogni eventuale problema. Concludo giudicando questa vacanza fantastica, consigliata a chiunque si voglia regalare una vacanza rilassante. Sicuramente da rifare in futuro. The apartment is quite simple but it has all you need for a relaxing break just a few minutes drive away from the bustle of San Teodoro and the beaches. It is spotlessly clean and well-equipped, although as UK visitors we did miss a kettle! Be aware if you are bringing your own bed linen that the bed in the main bedroom is big! I had taken double sheets, but it is at least UK king size and very comfortable. There is a small garden space which is very private, but unfortunately that means you can't see the views. However the pool is just a few steps away and provided the perfect place to relax and appreciate the surrounding mountains. The pool is clean and would be very good for young children as it doesn't get too deep. There are only a few sunloungers or chairs around the pool but there are some beach chairs in the apartment which we took over to the pool if necessary. Fortunately for us June is still classed as "low season" so the complex wasn't busy and we very often had the pool to ourselves. There is an agriturismo about 5 minutes walk away, but you need to drive to reach other restaurants. We found excellent ones in San Teodoro and Ottiolu Port. 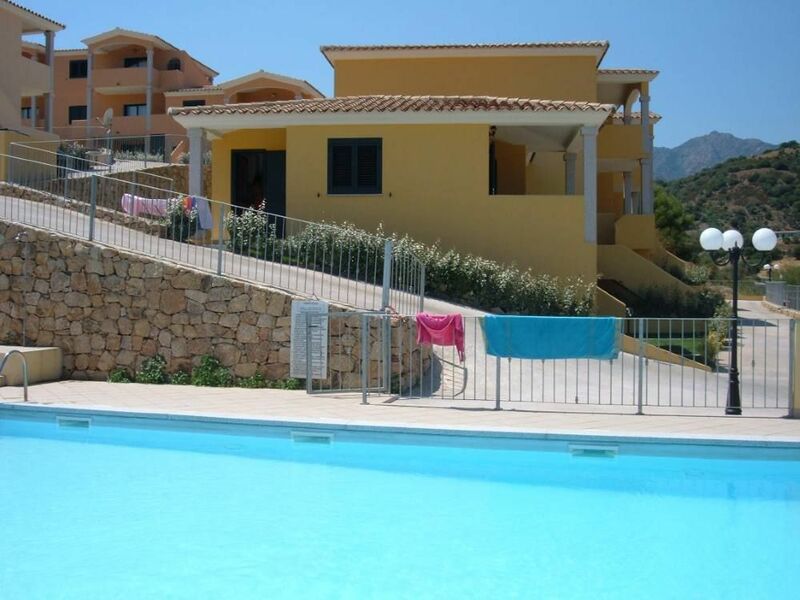 In summary, this apartment provides excellent value for a wonderful relaxing break in northern Sardinia. Easy access from the airport of Olbia Costa Smeralda or from the port of Olbia. In 25 km. of motorway (aprox. 25 minutes by car) you will be in our Residence in San Teodoro. Third exit on the motorway fromOlbia to Cagliari direction. My suggestion is for the rural sardinian cuisine, available just walking for 100 meters away from our residence. As an alternative, the wonderful Ittiturismo on the lagoon of San Teodoro for the Fish food lovers.